In 1913, on July 9, a customer purchased ice cream from the East Hill Grocery of The Dalles, Oregon. Each transaction at the store was apparently written on a separate sheet of paper complete with letterhead (The letterhead is shown below). It is not known what quantity of ice cream was purchased, but presumably it was more than a cone because of the price. Did they even have cones a century ago? Maybe it was for a special occasion. Perhaps a birthday. Or maybe, since it was purchased in the middle of the summer, it was just darn hot and the buyer wanted to indulge in a cool dessert. Was it chocolate? Vanilla? Doubt if they had fudge ripple back then. The clerk didn’t say. Guess we’ll never know. The East Hill Grocery was at 922 Elm Street. The phone number was Main 2011. The proprietor was F. R. Angle, successor to J. B. Higdon. Mr. Angle provided his customers not only with groceries but also with provisions, hay, grain and feed. 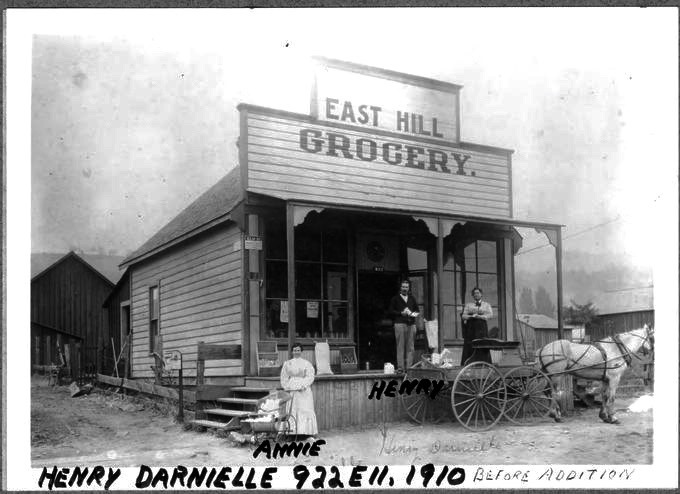 The East Hill Grocery, in 1910.